Each year, Penninghen accepts students who have already studied at other art schools and/or universities where they have successfully completed foundation courses, or those who already have a Technical College Degree or Bachelor Degree. To begin directly in the 2nd year program students have to complete an entrance test. Admission to the 3rd or 4th year Masters Degree program is only possible after an admissions interview and validation of design portfolio. 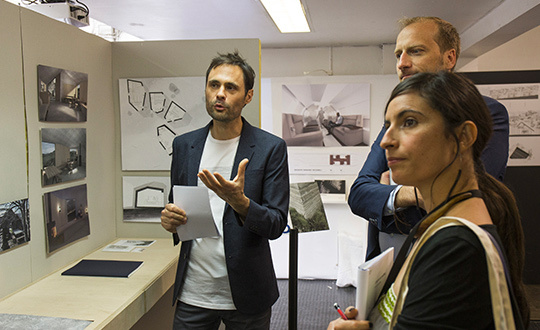 Depending on your professional project and entrance exams results you can study at Penninghen in the Art Direction or Interior Architecture Masters Degree program. Following the results of an entrance exam held in June every year, students can enter at 2nd year. Students must also provide a portfolio of personal design work clearly demonstrating design skills and drawing techniques within the Graphic Design, Visual Communication and/or Interior Architecture fields (depending on the course selected). The entrance exam takes place on 12th June (in one single session) where you will be required to take part in an academic drawing test consisting of a 4-hour figure drawing class. You also have to submit a personal portfolio of recent design work to be evaluated by a school jury. To apply for the Art Direction program you will be asked to design, work on and finalise a poster design project (to be completed within 4 hours). The aim is to evaluate your creative levels and ability to develop a page composition concept. To apply for the Interior Architecture program you will be asked to participate in a 4-hour spatial design project. The aim is to evaluate your creative levels within the spatial and scenic design disciplines. The entrance exam jury members are made up of Penninghen teachers, lecturers and school management staff. They study and assess both your personal portfolio and the design work completed during the 4-hour project. The results will be communicated to students one week later. Students who would like to apply for the 4th year program must provide a portfolio of their design work and complete an interview conducted by the school management. Students must provide a portfolio of their work clearly demonstrating design skills and drawing techniques within the Graphic Design, Visual Communication and/or Interior Architecture fields depending on the chosen study program.